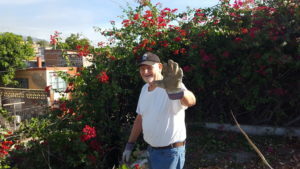 Each month our friars, social workers and nurse carry boxes with life sustaining food and some hygiene items to those in Guaymas who are too sick or disabled to leave their homes. They are physically unable to come to our dining rooms for food or our medical clinics for care. During this holy Lenten season, please help us to continue to help them. We provide Hope to the Poor and the Forgotten in Guaymas, Mexico. Our Vision is to illuminate pathways from the injustice of poverty to God’s abundance. We are the incubators for community empowerment. Your service mission team will minister to the Casa Franciscana support facilities while serving in Guaymas. Each day you will work in small teams on the facilities along with developing your Franciscan theological understanding. If you are seeking an affordable opportunity to renew or deepen your relationship with God, to grow spiritually or to witness Christ at work, join us as we travel to the active Franciscan mission in Guaymas, Sonora, Mexico. The Meson de Jesus is a dining room providing two meals a day, six days a week, for the people who reflect the poor neighborhood in which it is located. Toddlers with their parents, the mentally and physically challenged, travelers, persons suffering from addictions and the elderly come together to share a hot meal and a respite from a life full of hardship. Family members also carry food home to those who are too weak to walk. Additionally, the Meson functions as a community center with our social workers supplying support in many aspects of life. Some of the challenges are improving health with substandard living conditions. A free medical clinic and a dental clinic are located at the site where Father Marty Gates began his ministry in Guaymas in 1971. Women, children and the elderly with medical problems commonly associated with poverty are the most frequent visitors to the Clinic. Physicians and dentists volunteer their services. Donated pharmaceuticals as well as some medical equipment are available to clinic patients. In Mexico, nearly free public schooling is provided through the 9th grade. But for the very poor, textbooks, school supplies, required uniforms and shoes are not affordable. Also, it is an established fact that children cannot learn when they are hungry, sick, cannot see or cannot hear. Thus, CFO has a programs, funded by your contributions, that help these precious children to get the essentials of life in order to attend school. The Casa Franciscana de Guaymas Mission located in Mexico about 450 miles south of Phoenix, AZ, dates back to 1969. The Mexican Obregon Diocese asked the Franciscan Province of St. Barbara, USA, if the friars would provide pastoral ministry to the American community in San Carlos. The friars agreed under the condition that they could also serve the poor of Guaymas. The CFO, as a Franciscan organization, embraces service to the poor and promotes justice, peace, and care of creation, in the joyful and prophetic spirit of St. Francis of Assisi. Toward this goal, it now provides over $200,000 each year for the important work of the mission. 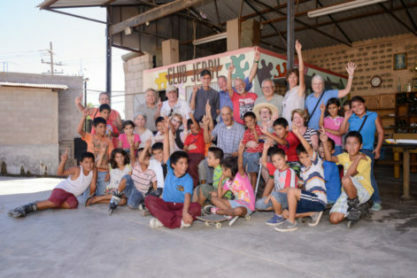 The mission’s current programs address the many needs of the poor of Guaymas through its medical/dental clinic, Meson de Jesus (dining room for poor adults), Meson de Ninos (dining room for children), food packages for the home-bound and many social services. These programs have a life-changing impact on the poor of Guaymas. By 2014, CFO funding and the leadership of the Franciscan friars has helped to establish and institutionalize a number of important cultural and support programs in the Guaymas community. These include a home for the elderly (the Asilo), an orphanage (Hogar de Paz y Bien), Jerry’s Club (a safe after-school recreational and life-skills program), Belles Artes (music academy for youth), women’s coop and a vocational training school. These programs are now sustained through local donations and ongoing major donors, including the Mexican government. Despite these successful programs, there is still much to do for the many suffering poor and together, we ARE making a difference! !